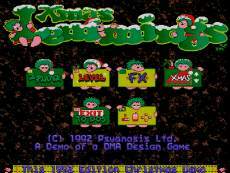 This edition of Xmas Lemmings is another free demo intended to promote Lemmings and Oh No! More Lemmings. It includes four entirely new Christmas-themed levels, in the same style as the 1991 demo: Jingle Bells and other Christmas songs as background music and the Lemmings moving through snowscapes dressed in Santa outfits. The holiday levels from the earlier demo were comparatively easy, but this one also includes some brain teasers comparable to levels from the main games' higher difficulties.